Tips for Selling Your Home in the Winter - Columbia Builders, Inc.
Knowing how to stage your home and make it more appealing during the winter could make selling your home during the colder months a breeze! Selling your home during the winter may seem challenging— cold or inclement weather might keep folks focused on indoor activities, not house hunting. 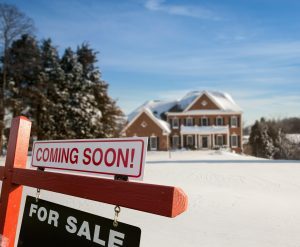 However, selling your home in winter can be a great opportunity, as the spring market often brings a surplus of new listings to the market – meaning your home may just get lost in the sea of homes to choose. With limited inventory and fewer homes new to the market in January and February, the timing can give you an edge, and less competition. By properly staging your home and understanding what makes a home more appealing during the winter, this advantage can be yours! It’s always important to keep your home tidy while it’s on the market, but when the weather gets colder, it’s imperative to keep entryways clean and clear. With all that outerwear – wet boots, heavy coats, hats and gloves –coming on and off with each trip outside, it’s easy for a floor to get dirty and the area to feel unkept. Keep a mop handy and be sure to hang and stow away your winter gear. When someone walks into your home from the cold, it should look and feel warm and bright. With limited daylight hours and the winter sun’s low angle, be sure to keep your home well lit, even during daytime showings. If a gas fireplace is the focal point of your living space, be sure it is highlighted – turned on for showings with a beautifully staged mantel, and sparkling clean surround and glass. Place a few cozy throws over your couch or chairs, and add to the ambiance by simmering apple cider with cinnamon sticks prior to a showing. Winter certainly brings to mind holiday gatherings, football parties and lazy snow days filled with hot chocolate and binge watching your favorite series. That’s why it’s important to demonstrate just how great your home is for hosting and entertaining guests beyond setting the dining room table. Do you have a finished basement or playroom? Be sure these areas are free from clutter staged to their full potential. What better way to keep younger family members entertained on snow days than having a great play area! Same for teens and adults as well – setting the stage for video gaming, movie watching, or a friendly board game can have prospective buyers considering how well your home will function – and entertain – all year long. First impressions are critical when selling a home. A welcoming entry, free from snow shovels and boots, along with snow and ice, is imperative. If you want your home shown, your driveway, walkways and entries must be kept clear of any frozen precipitation. Does your home feature an outdoor living space? If it’s covered, keep it furnished so it’s not missed during home tours. If your space includes an outdoor fireplace or hot tub, consider firing them up! It’s a great way to not only emphasize those features but also display the pleasure they offer no matter the season! This entry was posted on Friday, December 7th, 2018 at 12:00 pm. Both comments and pings are currently closed.